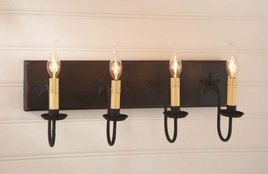 A classic country lighting fixture designed to illuminate your bathroom with ease. With a handpainted and slightly distressed wood with black textured arms and crimped pans, the light is sure to compliment your decor. Finish your bathroom's look with the 4 Light Vanity Light in Sturbridge. This light is pure country and will illuminate your bathroom. Has a handpainted and slightly distressed wooden back. Available in 4 finishes. Made in the USA. The Four Light Vanity Light with Stars in Sturbridge is handpainted & slightly distressed wooden back & metal star accents to complete the look in your bathroom. Available in 4 finishes. Made in the USA. Designed in a sturdy homespun wood with a Textured finish, the 5 Arm Vanity Light is the perfect decorating accessory. At home above the sink in a powder room or above a hall setting of a mirror and table, it will produce plenty of light. Designed in a sturdy homespun wood, our 4-Arm Mirror Light is the perfect decorating accessory. Equally at home above a powder room or hallway setting of a mirror and a table, it will produce plenty of light.